For sparkling glasses, shiny dishes and an active quick dry. Use for sparkling glasses and shiny dishes. The natural ingredients in the formula help to clear any unwanted particles, reducing smearing and streaking without the use of harsh chemicals. For best results use with Ecozone Dishwasher Tabs for a fresh, brilliant finish every time you wash. Suitable for use with septic tanks, this product has been produced in a factory using solar energy. - No unwanted chemical residues left on your dishes. 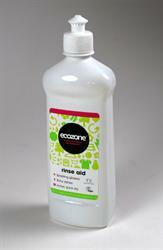 Be the first to submit a review for the Ecozone Rinse Aid.